I just love these old 70’s pieces. 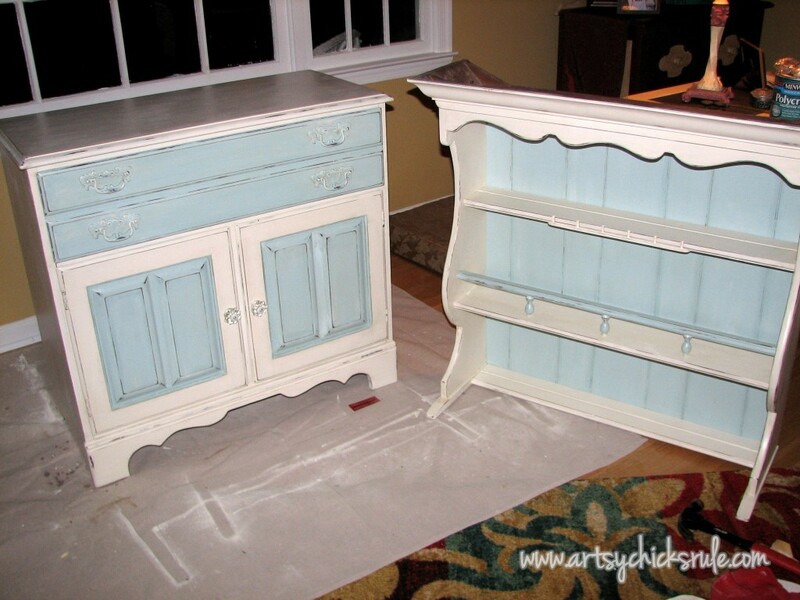 They’re perfect to transform with Annie Sloan Chalk Paint. They can so surprise you. 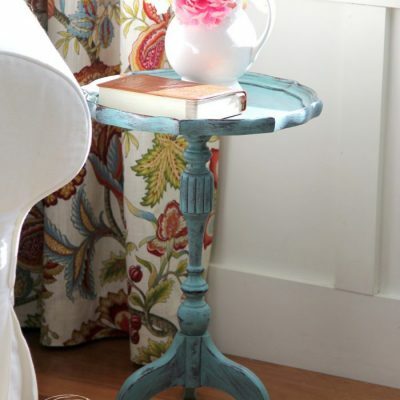 And they make the best “shabby”, “coastal” style furnture. 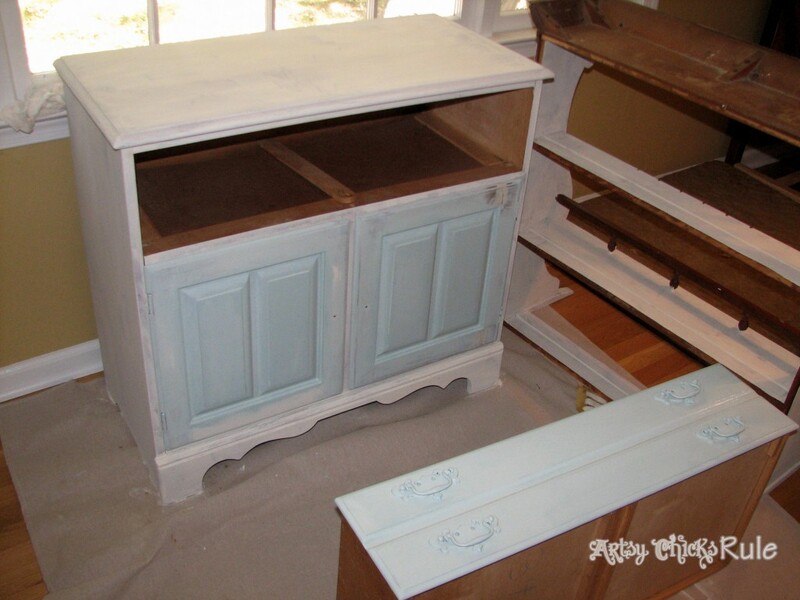 I grabbed this 2 piece hutch from a garage sale….for $35.00. Solid, heavy, very well made. 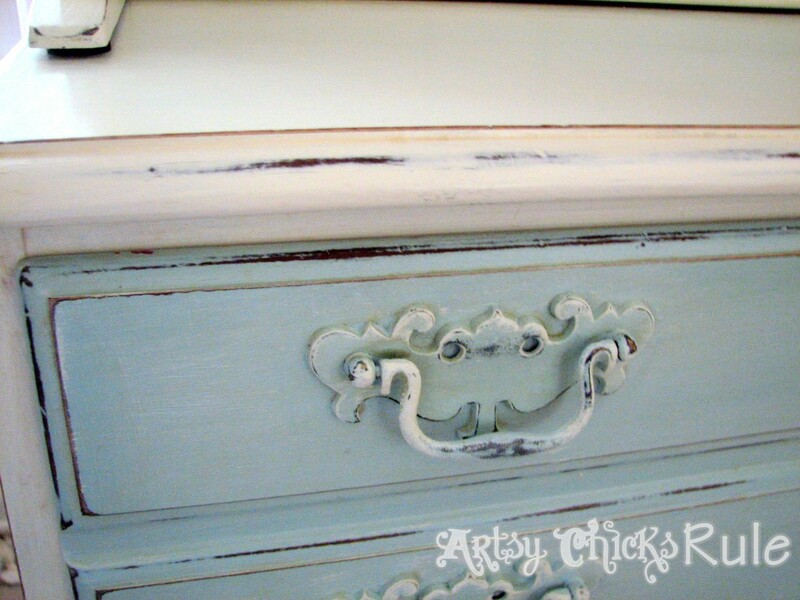 And of course, I painted it with the wonderful Annie Sloan Chalk Paint. Here is a before shot….very 70’s, dated. I had already removed the bead board backing to paint when I took this shot. I was painting it a different color and it’s so much easier that way! Popped it right off and went back on just as easy. pretty pale blue color. Very similar to Louis Blue. (please don’t ask what happened to the rest of this batch I had mixed up…. And I used Old White for the rest. As it goes with any creative process….I had thought I would paint the entire door blue. Didn’t like that at all. I loved this piece….to pieces. Really. I almost didn’t let it go to the shop but sadly I had no room for it. Hah! He was right, of course. Coffee Server” in this post here for this piece. I had a hard time leaving it at the shop and considered going back to get it! It’s now sold so I no longer have to stress over it. Thank goodness! 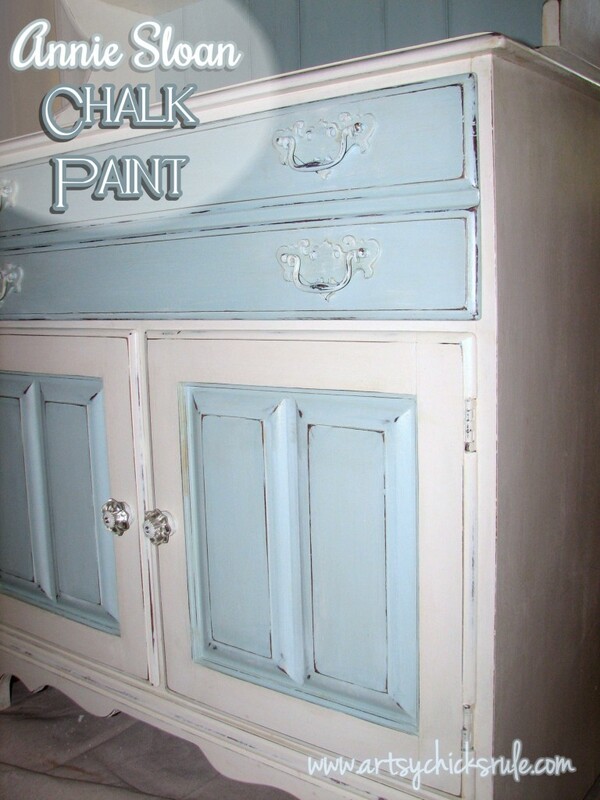 I sealed the Chalk Paint with Poly. I sometimes do that instead of wax depending on the look and finish I’m going for. 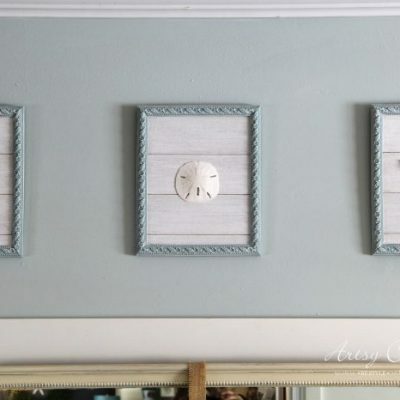 The handles…….I just love how they turned out. distressing a bit, to get this look. 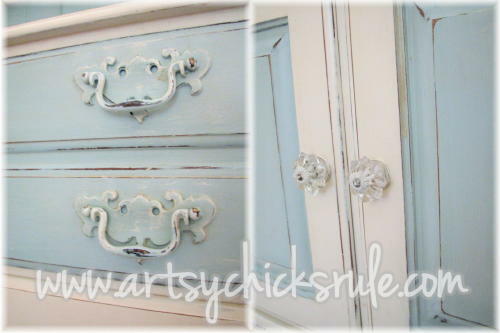 I added glass knobs to the cabinet doors….sigh…..
I’m sad I didn’t get to keep you pretty blue hutch. But I’m glad I was able to bring you back to new life! Re-stored, Re-styled and now Re-loved. I just LOVE the transformation. It’s like the best present ever seeing it finished at the end. Nothing better! 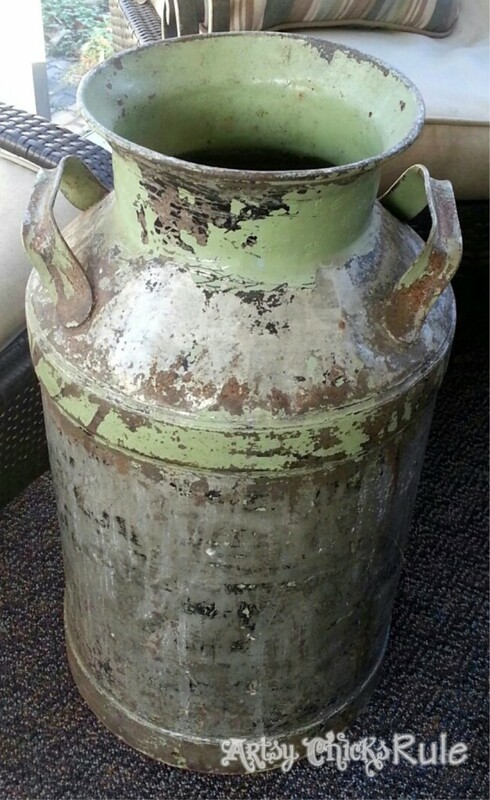 Do you have an old piece like this? Ready to paint it and turn it into something fresh & new?? 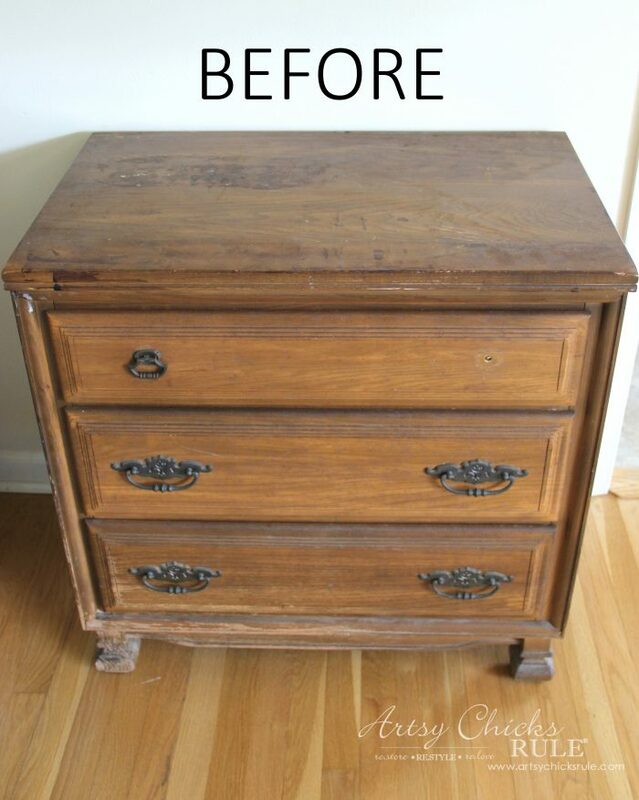 Be sure to check in next week to see what I did with this old thrift store find! Awesome steal and great job! I love how it turned out. I’m visiting you today from Not Just a Housewife. I hope you get a chance to stop by my blog and leave a comment, too! This is gorgeously beautiful!!! LOVE! Can’t wait to start my Annie Sloan project!! The blue you mixed is beautiful! I know how you feel about painting a piece, loving it and wanting to keep :) I do that all the time! It is beautiful Nancy! Thanks Sonya! I’m always mixing those paints. They mix so well and you can come up with just about any color you need. Yes, I always get so attached to everything I paint too. I think it is just part of that creative-ness in us. :) It only makes sense that we’d want to keep it all! Hi! Saw this on Instagram and liked it there, but just wanted to stop by here on your blog to see mord! Your work is incredible and sooooo inspirational! But I’m always afraid to try something like this! So I watch your transformations with envy…and will someday let go of the fear and give it a try. Your sleepin’ *helper* is cute as well!! Nancy, this hutch came out great. I love the colors you choose, great job!! I would have had a hard time parting with it to and The Mr. would have told me the same thing. That’s a beautiful hutch! I know what you mean with ‘as it goes with any creative process’. I also change my mind while painting. I invite you to join my link party every weekend: Crafty Country Cottage. Hope to see you soon! Thanks for the invite!! Hope you are having a great weekend! I LOVE LOVE LOVE the colors! That blue is just beautiful!! I hate when you get attached to a piece and yet fall in love with a new one. Then it comes down to something has to go….. sniff sniff! And yes, it is hard to let some of them go for sure!! Such a pretty color combo! 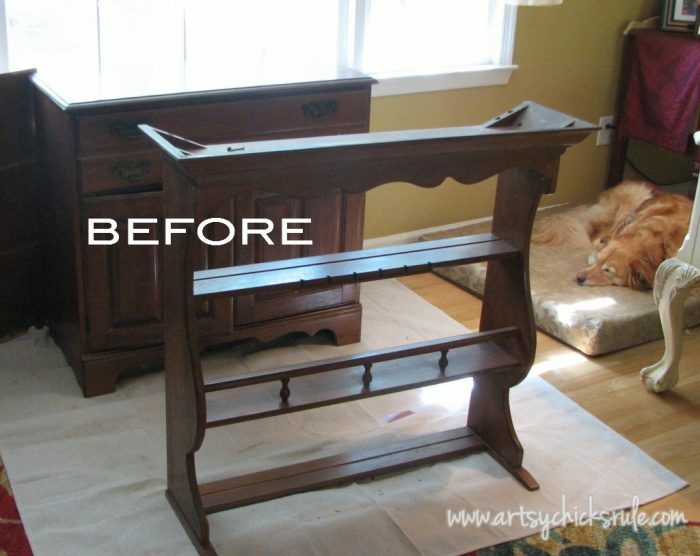 I’m featuring your hutch in the PoPP Spotlight this week. Thanks for linking up. The house we’re buying comes with a 1970s super cool french provincial dining table and china cabinet that I’m DYING to paint!! You just gave me some color inspiration! Love this and may be copying it! Did you use any dark wax at all to age it? It looks fabulous! Hi Paula! Thanks! I’m so glad you like it! No I actually didn’t use any wax on this piece at all. I just used a clear poly to seal it. Beautiful job, Nancy! 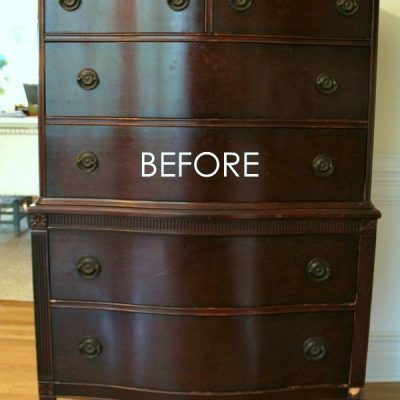 I love the distressing you did and how you treated the handles. Adorable little glass knobs too. Great work!! Hi Krista :) Thanks so much! I think the handles are my favorite part of this whole piece. You really worked your magic on this piece! I’m sure the new owner is thrilled to pieces with her purchase. Looking forward to meeting you at Luckett’s. My mom will be with me. I love how you distressed the edges. I admire people that are able to do this perfect imperfections:) Pitty you couldn’t keep it. 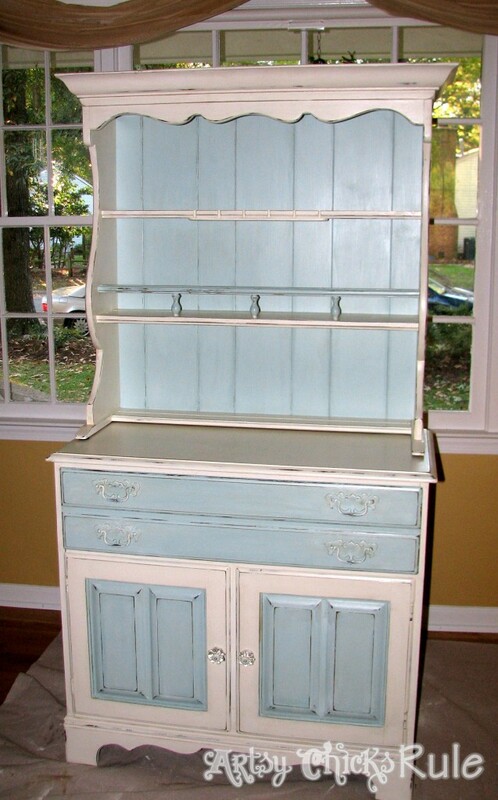 I keep looking and looking and looking for exactly this hutch. I love what you did with it! Fabulous! I am painting a hutch today and would like to know what “dry brushing” means please. Also, do you have suggestions about painting small wooden knobs that I have removed from the doors. The screw is still in the knob. I love this blue you created!! It’s the shade of blue I’m after and was wondering if you could kindly tell me what colours and quantities of ASCP you used? 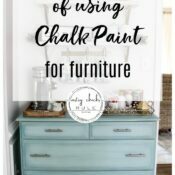 It’s not required with Chalk Paint to sand first or prime. I will sometimes sand and/or prime however, depending on the finish for added protection. On this particular piece, I did not though. 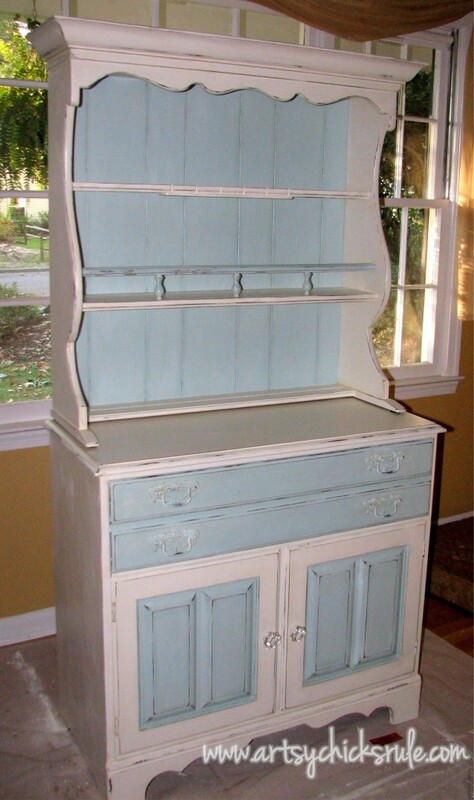 Hey Nancy…love what you did with this cabinet. You always come up with great ideas. You have mentioned the “shop” several times and am wondering since I am local what shop your in? Hey Sheila! This was back when I had my things in a shop (2013) :) And thank you! I love the old pieces and the life breathed into them with just paint! 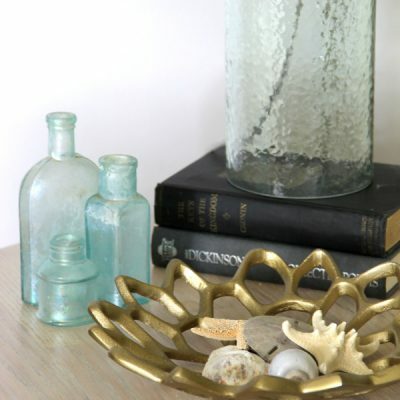 The top piece is what I’ve been finding to use as display pieces for the vintage markets I sell at. They work so perfectly. 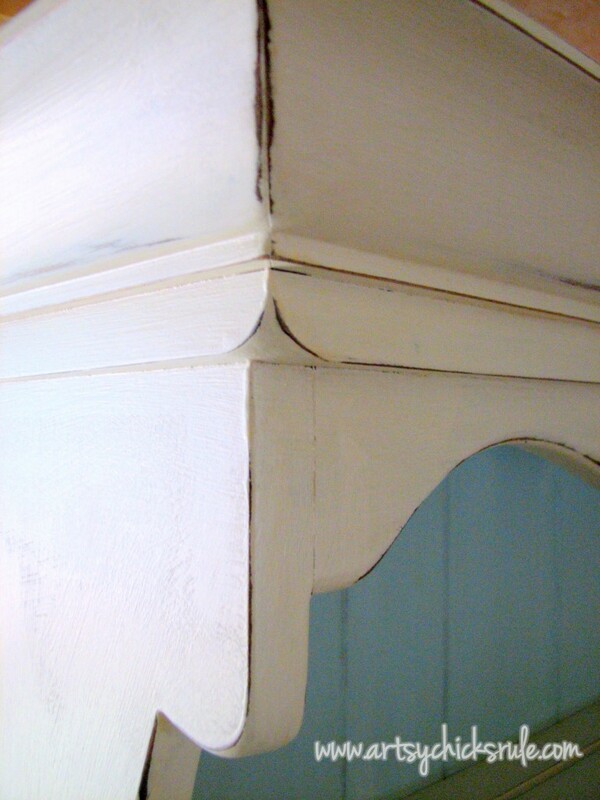 But I do have a question, do you, did you paint the inside of the cabinet, I often struggle with this decision. I adore those colors. Great job! Okay, what printer did you get? Love it!! I can see why you were considering keeping it, that colour combination is so pretty. I love how this piece came out! A perfect compliment for an home! Thank you Rose! :) It was hard to let go of!! 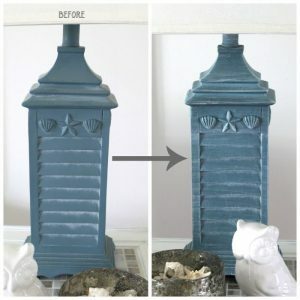 Yes I new you did that many years ago sorry about making you dig up a guess of which finish you used. You are so right wax has its drawbacks also.